The Memory Monument is a smaller version of our Commemorative Monument made of linear low density polystyrene, having the appearance of a miniature cut stone slant marker. 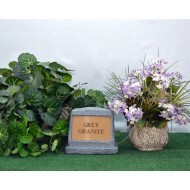 The Memory Monument is 8 inches wide, 7 inches high, and 5 inches deep with a recessed area in the front that is 4 inches by 6 inches, the size of a picture. 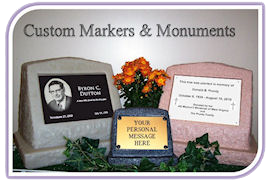 There is a 3/4 inch fill plug in the bottom that can be used to put either sand or ashes inside the monument. When filled with sand the marker will weigh about 6 pounds. These Markers are normally used inside, but are UV safe for outdoor use. They are available in 8 standard colors.